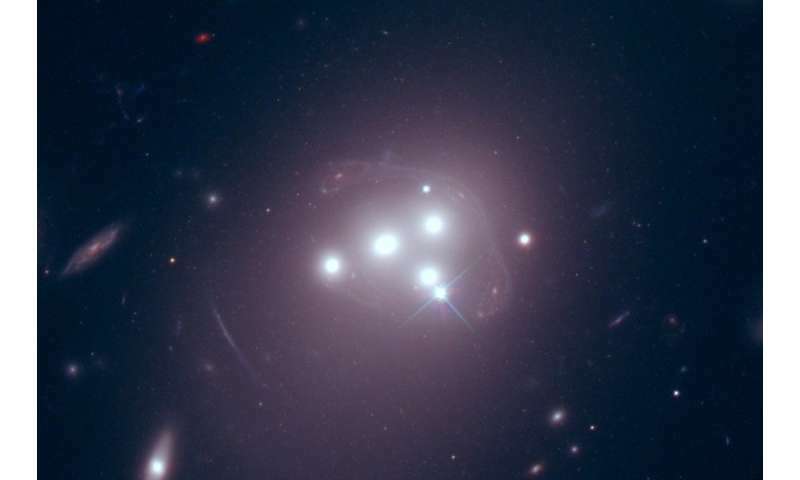 Observations using the Hubble Space Telescope appeared to show that a galaxy in the Abell 3827 cluster - approximately 1.3 billion light years from Earth - had become separated from the dark matter surrounding it. Research co-author Professor Liliya Williams, of the University of Minnesota, said: "We got a higher resolution view of the distant galaxy using ALMA than from even the Hubble Space Telescope. Robertson, who is a co-author of the work, and based at Durham University's Institute for Computational Cosmology, added: "Different properties of dark matter do leave tell-tale signs. "We will keep looking for nature to have done the experiment we need, and for us to see it from the right angle. "One especially interesting test is that dark matter interactions make clumps of dark matter more spherical. That's the next thing we're going to look for." More information: The new research will appear in "Dark matter dynamics in Abell 3827: new data consistent with standard Cold Dark Matter", R. Massey et al., Monthly Notices of the Royal Astronomical Society, in press. It follows up the 2015 research paper, "The behaviour of dark matter associated with four bright cluster galaxies in the 10 kpc core of Abell 3827", R. Massey et al., Monthly Notices of the Royal Astronomical Society, Volume 449, Issue 4, 1 June 2015, Pages 3393-3406. It doesn't strike me as an especially surprising result that dark matter interactions (assuming they are all attractive) would make clumps more spherical. The same thing is true if there is more matter there. DM interactions have the overall effect of increasing the attraction between DM particles, and thus have the same conglomerate effect as increasing the gravitational forces between them. Large clumps of matter assume spherical shapes. Why would dark matter clumps be any different? Huh. There goes one big piece of observational evidence. A single, fuzzy observation was repeated and found to be fuzzy and not repeatable. Wonder what else will happen as actual evidence is gathered? The problem is we don't understand gravity and its role/limitations in the universe. Dark matter is ONLY postulated to exist exactly where the forces of gravity alone fail to explain the motions of celestial objects. This is like blaming the elves for moving your keys around your house when you can't find them. And your house is about 80% elves. And the search goes on and on. And on and on. When will this craziness stop? And if there was anything else in the mix, it'd be being investigated. MOND is one such, but various flavours of that took a kicking from the gravitational wave detections, as well as the Bullet Cluster observations. So, there ain't anything else to look at currently. I thought this was the bullet cluster. It's just very similar, I guess. Maybe they need to look more closely at that one, too. We have a theory of the holographic universe that may work for matter and energy. Can the holographic universe predict a dark universe component? If it can't then DME is not holographic and may not contain information like normal space. If it does not interact with space it might be in the same volume but not in a space time that has uniform laws of physics. If dm could form a black hole it would be cold with low emissions but high gravity. This is Lisa Randalls idea about dm forming a disk in the same galactic plane as normal matter. Gravity is not a force. Calling gravity a force and thinking of it as a force is a bad habit. Gravity can exist without matter. have I missed anything? Maybe these scientists suffer from a over eagerness to make a BIG discovery and get their names in the papers. Maybe we should ignore them till the results are verified by an independent team lest physics go the way of psychology. "Dark matter might not be interactive after all?" Just any god? Brilliant cop out! Gravity can exist without matter. is there any empirical evidence of this you can reference here? or can you provide us any other kind of reason why we should believe this? All the evidence is that there is dark matter. If it only interacts by gravity it may be more challenging to detect. I don't understand why we don't see its affects in our own galaxy except that it must travel faster than our gravity can hold onto although there could be some by the sun. an the holographic universe predict a dark universe component? The holographic universe model doesn't say anything about how much or what kind of matter the universe contains. It works just as well (or badly) on a universe with DM, without DM (or without any form of matter at all). If dm could form a black hole it would be cold with low emissions but high gravity. Just like any other black hole then. The idea of non-interacting matter isn't new. We know for example of neutrinos which almost never interact with anything. Trlllions of them are fleeting through you every second - yet we know that they exist (first from theory and later from experiment). Where exactly is your problem with the idea of slightly less interacting forms of matter (if you accept that neutrinos exist, that is)? grandpa, ha! Your first comment is a big lie. FAKE NEWS! There is currently ZERO evidence of dark matter. Millions of man-hours and machine-hours have be spent trying to find something. So far everything has come up empy. Simple, its just normal matter that is going backwards in time relative to us (i.e -c in all directions). You have to design an experiment that can discriminate between this idea and any classical view on DM. That is the only way to make a point in physics. Many ideas are possible but you need an experiment to test them. It is a difficult question. Is the curvature just some stable local minimal,, without mass distortion? A sort of stable dip in the blanket that has found some semblance of equilibrium. Or must it be some exotic "thermal"-like emergence based on some kind of gravitational history? When you try to consider frame dragging with degrees of freedom, like orbital angular momentum, you have to ask about the Ricci curvature in more dimensions. Can we consider DM to be a cotangent bundle to treat it as non-interacting? If we place all precedence on gravity, this is hogwash as, "thermal" time is what should be considered. There are good reasons to consider informational preservation into some kind of gravitation substrate. Cyclic Comformal Cosmology is presently thought of as a falsifiable hypothesis, but it still has to consider the CMB and primordial black holes from the last era. The holographic account is still working on its prioritization. At least we think it is not just gamma bursts. Do you have an experiment for the inflationary field? Observations in the cosmos can help us better understand Nature's telios. What makes a weaker banker to borrow from over a longer period of time (QED), a psuedo-tensor of self energy, a fracturing of super symmetry of a real tensor network? Symmetry has non informational content, it is the asymmetry that tells us something. Self-energy does not have to be self sustaining, though its negative energetic reservoir could run deep. It seems we where intended to tolerant different perspectives to explain the same phenomena, even in relational theory. The dialect still has telios. Well, you throw out that one and all the alternate theories that hold dark matter may not even exist are back in play. That was the biggie, here was a case where you could absolutely say it did exist, that it was some kind of particle, because you could actually see it separate from ordinary matter. Now it could be some kind of emergent phenomena or anything or nothing, just a flaw in our current understanding. "Seven Hints For Primordial Black Hole Dark Matter"
The DM ain't no particle. Does this hold true even if the recent estimate of over a trillion galaxies in the universe (10 times previous estimates) is correct? I think what you are saying, it is neither necessary nor sufficient that dark matter even exist. You are aware that gravity is not a separate force of nature. Source? How long have you been seeing these ghosts? And if there was anything else in the mix, it'd be being investigated. MOND is one such... So, there ain't anything else to look at currently. But why are we still looking for any dark matter theory? Dark matter is purely ad hoc, there's no denying that. No science has ever postulated any reason to think a 'dark' matter must be toying with normal matter solely on a gravitational level. But is the theory even falsifiable in any way? If you could attain whatever evidence you desire, how could you ever disprove the existence of dark matter? So is it even a viable theory anymore? Travelling gravity waves interacting with other waves, gravitational bodies subject to relativity and time to even include it's own orthogonal remnants from a previous time. To be honest, I don't know why some comments seem to be adverse. Basically, there is something 'out there' that appears to have a gravitational property and articles like the above, imho, just seem to be saying that we are still in the dark as to what is causing the effect. Okay, if someone has a theory that can account for the apparent effect, fine, just provide a means for testing that theory and I'm sure there will be some scientists willing to try it. After all the idea is to solve the problem isn't it? Yes, of course. Things are moving about in a way that they shouldn't ought to be if baryonic matter were all that constituted the universe. We see the strangeness going on in the Bullet Cluster, which defies description without DM being invoked to explain the morphology, and the lensing that we see. And other observations. So, it is the best explanation out there. MOND is just about hanging on, but still has to invoke DM, albeit less of it. You can't just say, "oh, we'll never figure this out, let's stop looking/ theorising." Things don't add up, and it is human nature to want to see what the cause of the mystery is. Who knew neutrinos had mass until ~ 15 years ago? Are you referring to Gravity Waves or Gravitational waves? My understanding is that weak gravitational waves interfere, temporarily I think...that is, pass through one another. If 'strong' then I think (but am not sure of my understanding here) then space-time properties are affected to a point where a singularity might form. I am sure someone here more knowledgeable than me could be more precise. This doesn't rule out dark matter. It certainly doesn't have anything to do with the Bullet Cluster, which clearly shows the separation of dark matter from bright matter. And they started looking around, and they've found other less dramatic looking but equally compelling collisions with dark matter as well. These are impossible to explain with MOND or any other theory based on a defect in GRT. If the mass all moved over *there*, how come there's gravity over *here*? It doesn't make any sense for it to be some correction to GRT. It makes a lot of sense for it to be some form of particulate dark matter. It doesn't matter for this whether it's self-interactive or interactive with bright matter, or not. Pretty interesting, @nova, and they've even suggested a way to test for it. We watch LIGO/VIRGO and see if we see any sub-Chandrasekhar limit BH mergers. This will eliminate both BHs and neutron stars as candidates. So astronomers had first collected some earlier data that implied that a galaxy had become separated from the dark matter surrounding it, an interesting possibility predicted by some but not all dark-matter models, but then later new data showed it hadn't separated after all. I really don't see how anything of significance can be concluded from that. Merely showing that this one particular galaxy hadn't separated from it's dark matter very far by itself rules out the possibility that we will later observe a galaxy which we can observe to have indeed separated from it's dark matter. And it certainly very far by itself rules out the possibility of the existence of any non-gravitational dark-matter-visible-matter interactions. I think this is a case where we will just have to 'wait and see'. The Universe is 27% dark matter the remainder consisting of mysterious dark energy. Normal matter, such as planets and stars, contributes a relatively small five per cent of the Universe. Calc98 fires up again, 27% D.M, 68% D.E and 5% N.M, no explanation how 100% of the mass of the universe consisting of planets and stars are composed of a 100% of normal matter (N.M) out of lies to little children come truths – D.M having no relevance in N.M what's the point of D.M? It's a long time since I was active in experimental astrophysics (CMB) so please forgive any unintended offence. I truly admire and respect the experimental process to test our posited theoretical framework. But I can't help thinking there must be something profoundly wrong with our understanding if our current theoretical framework requires something as unreactive (apart from gravity) to represent 80% or more of the mass of the universe. I suppose really I'm just asking for help understanding the "need" for dark matter rather than a rethink of our current theoretical framework? For example, does General Relativity require or anticipate dark matter? The clouds of dust in the universe "Normal matter, such as planets and stars, contributes a relatively small five per cent of the Universe" are the 5% of N.M. By implication contain no D.M or D.E! D.M and D.E complement, the equivalent of E=MC* in N.M - further proof the dust clouds are composed of normal matter and E=MC* equal 100% the mass of the universe. The strange and wacky world of mathematics where 27%+68%+5%=100% where the 5% =100% of all the matter in the universe with untold trillion upon trillion upon trillion tons of matter, strange how mathematics can be accurate while still achieving 100% out of 5% this has conations to milnics famous quotation "out of nothing comes something"
alexander2468> The Universe is 27% dark matter the remainder consisting of mysterious dark energy. Normal matter, such as planets and stars, contributes a relatively small five per cent of the Universe. Calc98 fires up again, 27% D.M, 68% D.E and 5% N.M, no explanation how 100% of the mass of the universe consisting of planets and stars are composed of a 100% of normal matter (N.M) out of lies to little children come truths – D.M having no relevance in N.M what's the point of D.M? Mere mathematical models can never account for universal processes. The human mind is the subsuming evolutionary universal process. The only science that matters is a mission oriented one that benefits humanity's future. All else is irrelevant terra incognita. "However, dark matter is an essential factor in how the Universe looks today, as without the constraining effect of its extra gravity, galaxies like our Milky Way would fling themselves apart as they spin." If you reject the existence of "gravity" and embrace expansion theory, none of this nonsense is required. dark matter may or may not exist but either way dark matter theory isn't "nonsense" because it is based on actual observations of how galaxies rotate and the perfectly reasonable albeit not necessarily correct assumption that our current understand of the law of gravity corresponds accurately to reality + Occam's razor applies here as the suggested alternatives to the theory are generally more complex than the theory they are meant to replace although I think I may have heard one impressive exception to that (but not from any of these posts but from an article). To show that something is 'nonsense', you need to show that it is either contradictory or is such that it is very unreasonable to think it could ever be true. Excellent. Somebody should reject 'gravity', embrace expansion theory (whatever that is), and jump out of a third floor window, and then report back on how they got on. perhaps he thinks gravity is one big global conspiracy made by the greedy parachute manufactures to maintain their cover-up that you don't need a parachute if you jump out of the plane; if you only knew that gravity doesn't exist you could just gently float down to wherever you like. It is also a government cover-up because they don't want us to know gravity is only in our heads and we can avoid taxation simply by floating away up into the sky to god knows where whenever the tax man visits. The existence of non-baryonic dark matter is heavily dependent on Universe Age approximations. Since "Big Bang Theory" is barely even a hypothesis with nothing more than crude supporting evidence simplistically deduced from background radiation in our observable nook of the Universe in my books, the age of the universe is not even a probabilistic approximation. I'd label the 14 billion or so approximation nothing more than a wild guess gotten to by limited data. The universe could very well be infinite in age, with the mass/energy ever present. Within the construct of the Big Bang timeline, there is nowhere near enough of these to account for the gravitational effects observed. The existence of non-baryonic dark matter is heavily dependent on Universe Age approximations. I wonder whether we might have made a mistake by talking about dark "matter", since energy fields have a mass equivalent and a gravitational effect. So I wonder whether the discussion might be advanced by assuming, for the sake of argument, that we are in fact dealing with some sort of unknown energy field. For instance, in the early universe this field might have interacted more strongly with matter, and might have played some role. But now, perhaps, it is just a remnant, displaying gravitational effects and little else. Gravity is the collective effect of every charge in the universe to a superimposed point at a distance +/-r assuming an equal field or opposite field, that actually exist with respect to each charge center at that instant in time or more defined a mathematical tautology. So adding an unknown to fit theory instead of throwing away the theory? Every charge center see's every field and is mathematically equal to the existence of a charge at a point that will produce the observed. Truth! Then Theory. Not "theory then it does not compute," or have any measurable affects, this is nonsense using only the field as evidence! Who started the nonsense? I observe a proton within a cloud chamber while observing "Cosmic" rays, and it moves exactly like an electron only diametrically, I call "particle" an anti-electron? Me, smart! You do not understand from what I speak! Then! 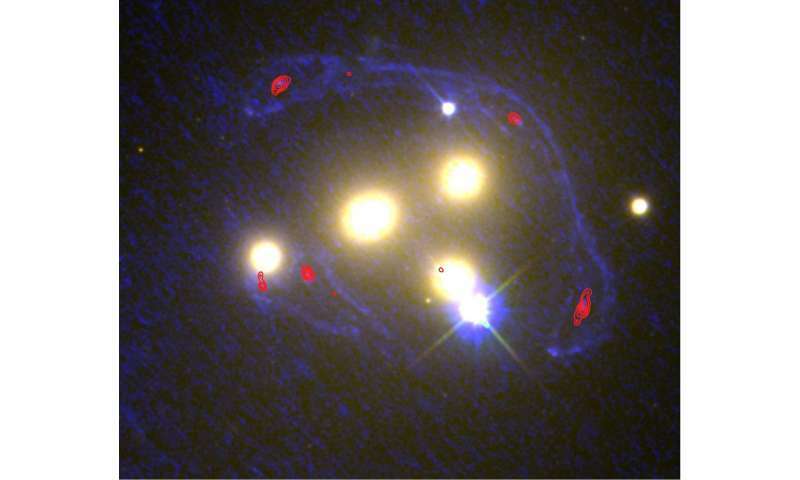 Along came dark matter! Soo mysterious! This doesn't explain how/why such effect arises and it even contradicts the fact that neutral particles like neutrons also exhibit/feel gravity. You're not smart enough for to call other people idiots. I think this period is marked by the grave site of Hypatia of Alexandria. Logic allows a collection of points to occupy a point,you can even stack them as + or -, anyway GR is nonsense. But your stubborn denial of what exist is what you deny. Is that the square of stupid? Very interesting discussion, but only for the "darkness" of ignorance of what is being discussed. You all talk about something "dark" about which you do not have any proof or whether it exists, and you know the percentage of that "dark" in the universe. Who is "dark" here or what does not exist at all. Mackett keeps talking about some dense ether, but never says what the ether is. In your discussions, there are 90% of "cocktails" of some unqualified proof and fabrication. Whoever does not see the existence of the Spiritual Entity of the universe, it does not know the structure of the universe, nor any natural laws. Science has allowed itself to have a formula, model, or some kind of fabrication that will lead them to the true causes of the phenomenon. These are all fatamagers and there is no need to waste time proving that such nebulosities are true. Dark matter is dead again, we live in an Electric Universe where EM controls on the largest scales. 5) but 'interactivity' NOT observed!...so what now? Is it at all feasible that Dark Matter is a remnant of the previous universe after implosion and before the Big Bang created a different, new (our) universe? @RealityCheck: From my own very limited understanding of how the term "Dark Matter" actually arose in academic ranks, I tend to agree with you. Simple (simplistic, if you will) logic indicates that the simplest answer is usually the best. In dense aether model the Universe is eternal and infinite. mackita,who established this model and when it was done, because I would like to see it and compare it with this Aether I'm talking about. Again I have to agree: all those who use the consequences of the invented BB are not scientists. They are participants in the "rewriting activity", none of them gives their opinion, but only with the head of the head and confirms that it is "true". Look, Dumbo, I say that the surface of the expanding Earth rushes up to where that third floor window was, but you think there is this mysterious force that no-one can reproduce/deflect/shield against/etc. What evidence do you have that you are right and I am wrong? Dark matter exist in order for stupid professionals to sound even stupider! And you're calling me dumb...???!!! Lol. Go write it up woo boy. All those who claim and think that there is a dark matter, have in their brain something indeterminate, which is ignited by consciousness, and even more is the nebulosity to say that dark matter and time cause the appearance of gravity. Let's light a little light on that dark vision. Signs and time and dark matter were formed before the onset of gravity, second: both time and dark matter have attractive traits. How then a photon was born to whom, as they say gravity works, means that he is a dark matter. What makes up the particles that are not gravitated? If gravity gathers matter into groups of mass, it means that everything is formed of dark matter, but we have not yet seen anything or seen or measured it. Of course dark matter is un-interactive. "Brilliant Light Power has developed a new commercially competitive, non-polluting, plasma-based primary source of massive power from the conversion of hydrogen atoms of water molecules to dark matter, the previously unidentified matter that makes up most of the mass of the universe. The SunCell® that was invented to harness the new power source catalytically converts hydrogen directly into dark matter form called Hydrino® releasing brilliant high-energy light which is down-converted in energy to facilitate the production of electricity using commercially-available concentrator photovoltaic cells." -But creating it is very interactive indeed. If, as I suspect, your IQ is < 50, get somebody to explain it to you. What I find puzzling that people get hung up over the issue that dark matter doesn't seem to interact with anything. Why does everyone assume that interaction between stuff is the norm (rather than the exception)? Just because interaction is needed to support life and therefore all our senses are geared towards the interacting kind of stuff in the universe? Methinks there might be an inherent bias in the "stuff-must-interact" attitude. I'm wondering if these 2 posters are both zephyr? Anybody else suspect this? Dark matter is the empty space left after you remove all the charges and their fields. @antialias, that's a pretty good point, and we've already been through this same problem with neutrinos. It took three conservation laws to establish that neutrinos exist in the minds of the scientific community; it's hardly surprising that particle DM hypotheses are still controversial and that various alternative explanations are still being proposed. as follows : dark matter=Aether ! You do know you are renaming a NULL set as Aether. Maybe you should just get high, Newton did! Makes you wonder, what was he on? How can we not agree in any way !. There is no vacant space in the universe. There must always be some substance that fills each space, and even the one in the atom fuses the core and the envelopes. This substance fills in and scows subatomic particles. This empty space called vacuum is not empty, there is AETHER. Understand it once and everything will be easier to understand. What can not be excluded from this vacant space, it is the basis and trigger of phenomena such as gravity and magnetism, and from magnetism and under its influence all other phenomena are created and modified according to certain natural laws through a series of processes. You are just making stuff up. There is nothing other than charge and charge is actually only a point in its field. I remember aether; thought that was what Michelson and Morley proved did not exist. Who causes the appearance of electro and magnetic fields where they were not? What is the charge and who supports it? You all think it appears only by itself, but none of you is thinking, whether there is something from which all this is formed and who is the one who forms it. Do you believe more about the experiments performed 80-90 years ago than those that are being performed today. Today's experiments are more political than scientific. I get it. A nonsensical rant! OK, what is is? Gentlemen, we are discussing phenomena observed by scientists and trying to understand the causes of their emergence. Yes, I see all these explanations as a result of the wrong basis on which they build evidence. If you want to find out and explain a phenomenon, you must first of all know three basic concepts and their significance and the causes of their occurrence. But it must be based on natural laws, not on the formulas and on some invented models. These three factors are: matter, gravity, and magnetism. If you know how they originate and what kind of relationships they have, then you will not have any problems in seeing all the features of these factors. Today's science does not adhere to these postulates, and therefore there is no solution to many phenomena in the universe. Simpler to admit only fields exist whose centers we call charge! Since charge is immortal, these field have an infinite range, no matter how small it gets, remember supposition applies!